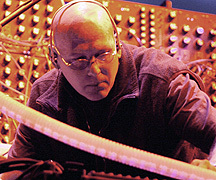 An artist engaged in producing compelling music, Robert Rich's ears are attuned to frequencies of nature as equally as they are to those of the electronic. Containing nine tracks, each uniquely glowing with a self-generated light, the CD Filaments (59'16") is Rich's audible carrier of contemplative messages. His clear steel guitar voice, foregrounded over driving tone patterns, easily activates our mental mechanics. Beneath cavernous reverberations, ghostly traces of sound writhe in shadowland interludes. Within the slow burning, controlled drama of brief quietude, spacey chording rises in chilling synthesizer shades. It is here that simpler flute motifs are permitted to evoke their own sonic poetry. 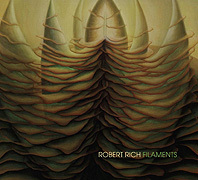 Filaments features an abundance of music built on Rich's exotic rhythmic principles. Within this zone we find mounting kinetic realizations unfurling like a gorgeous dream - with the meticulous braiding of twinned sequencer lines engaged in elevating the thoughts of the listener. Filaments can be exhilarating, with the thrill of this album found in its lingering appeal. It may not be something for everyday listening, but it is there when we really need it. Humans find it hard to articulate the Now, so Robert Rich concerns himself with everything else. In a great structure of thought he has conjured an idealized world of sound where Spacemusic, New Age and the Avant-Garde all share a common spirit. Few musicians reach as high as Robert Rich does. A masterful and skillful work, Filaments will impress STAR'S END listeners, but aims for an effect beyond logic.